But in the meantime, theatre rolls on. And in the case of the Ottawa Little Theatre, it rolls on and on and ON, centuries be damned. Yes, the OLT (formerly the Ottawa Drama League, for those of you from 1916 or so) is having its hundredth anniversary this year, and to celebrate they’re rolling out one play from each decade they’ve been around. 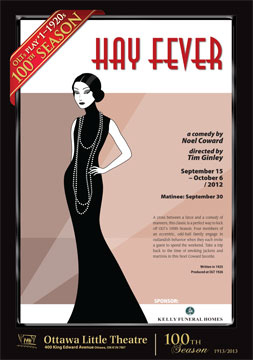 First up was the one I saw last night, the classic comedy HAY FEVER from sir Noel Coward. The whole OLT gang is clearly excited about the new season, and I have to say right off the bat…nice gimmick with the national anthem. But, on with the show! FEVER revolves around a rather silly weekend at the country home of the Bliss family, a stylish and mannered clan of upper-crust misfits who behave in much the same way I imagine the Addams Family of their time would have. Led by aging stage queen Judith (Diana Renee Yorke) and her reclusive writer husband David (Klaas Van Weringh), both of whom make little effort to teach their teenage children (Sorel and Simon, played by Katie Volkert and Jeremy Piamonte) anything approaching useful. On the weekend in question every family member has invited a ‘special guest’ up to the house, without informing anyone else and expecting to have the run of the place. Merry chaos ensues as diplomatist Richard (Penu Chalykoff), boxer Sandy (Andrew Stewart), flapper Jackie (Katie Kaufman), and sophisticated wit Myra (Zoe Tupling) try to navigate the ill-mannered Bliss household, and keep on the good side of put-upon housekeeper Clara (Gail Malloy).